More than two years and $50 million dollars later even some liberals are now forced to admit the whole Trump-Russia collusion story was a hoax from the very beginning. …Since the summer of 2016, there were countless pushers of the narrative that President Trump’s campaign had colluded with Russia to win the 2016 election, specifically by conspiring with Russia to steal and distribute stolen emails from the Democratic National Committee and Hillary Clinton’s campaign chairman. This included anonymous current and former officials and those in the media willing to publish their allegations, friends of those officials, Democrat members of Congress, those wanting to promote themselves, and of course, Clinton and her campaign officials. (1)CNN — CNN first reported that President Trump was briefed on the “pee dossier,” which prompted BuzzFeed to publish the dossier in full. CNN has also given vast amounts of airtime to analysts, former officials, and Democrat lawmakers pushing the Russia collusion narrative. It has also published a number of stories that advanced the narrative, including several that turned out to be false. (2)BuzzFeed — BuzzFeed first published the “pee dossier” in full — which released to the public unfounded accusations against President Trump, including the unverified claim that he hired prostitutes to urinate on a bed during a visit to Moscow in 2013. At the time of publish, the dossier remained “salacious and unverified,” in then-FBI Director James Comey’s own words. (3)The Washington Post — The Washington Post was on the forefront of publishing anonymously-sourced stories suggesting collusion between Russia and Trump campaign officials. It published the intelligence leak that former National Security Adviser Michael Flynn discussed sanctions with Russian ambassador Sergei Kislyak that led to his firing later. Flynn ended up pleading guilty to one count of lying. There were no collusion charges. (4)The New York Times — The New York Times published a front-page, top-of-the-page story on Inauguration Day suggesting that President-elect Trump’s associates had been “wiretapped.” Though the report admitted, “It is not clear whether the intercepted communications had anything to do with Mr. Trump’s campaign, or Mr. Trump himself,” it set the very inauguration of President Trump as part of a Russian conspiracy. (5)Rep. Adam Schiff (D-CA) — Schiff, now the House Intelligence Committee chairman, has been the No. 1 pusher of the Russia collusion hoax in Congress. 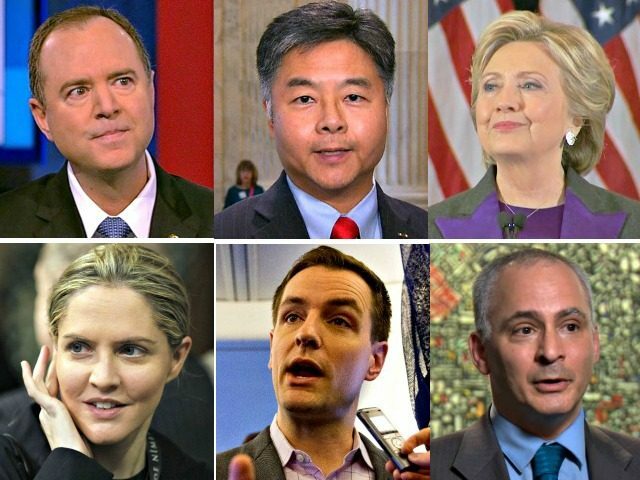 Absent any direct evidence of collusion, Schiff has argued for months that the evidence is “hiding in plain sight.” Schiff has also tried to fundraise off of the hoax. (6)Rep. Ted Lieu (D-CA) — Lieu has been a close second to Schiff’s promotion of the Russia hoax in Congress. He once called for a pause in the “entire Trump agenda” until an investigation into the collusion ties was completed. (7)Benjamin Wittes — Wittes, a journalist who is close to former FBI Director James Comey, was a lead inciter on Twitter of the Russia hoax, infamously tweeting cannon gifs every time a new sensational report came out that advanced the Russia collusion narrative. (8)Louise Mensch — Mensch, a former British parliamentarian, has become a household name among the anti-Trump resistance in the U.S., with her fantastical tweets about “sealed indictments” and grand juries. (9)Hillary Clinton — Clinton, the day after losing the election to Trump, wanted to promote the idea that Comey’s reopening of the investigation into her emails and Russia led to her defeat, according to the book Shattered. “She wants to make sure all these narratives get spun the right way,” a Clinton ally told the book’s authors. (10)Robby Mook — Mook was the first Clinton campaign official to go on record suggesting there was collusion between the Trump campaign and Russia, during an ABC News interview at the Democratic National Convention in July 2016, shortly after stolen DNC emails were released.